Now this month, we come back to the theme of leadership in the church, as 1 Corinthians 9 picks up some of these crucial themes. However, Paul is not merely digressing to complete what he left unsaid in 1 Corinthians 4. Rather, he is using his ministry as an example of self-denial for the good of others. At the same time, he is defending his apostleship against the examiners in Corinth. 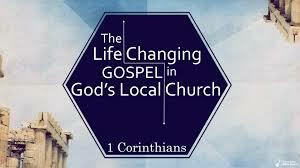 In this way, 1 Corinthians 9 reveals how gospel-centered ministers and gospel-centered churches work together to announce the good news of Jesus Christ. This week’s sermon focuses on the rights of gospel minister; next week we will (Lord willing) consider the second half of Paul’s argument, the rights he refused for the sake of the gospel. You can listen to the sermon here, read the sermon notes here, or discuss the questions and resources below. 1 Am I not free? Am I not an apostle? Have I not seen Jesus our Lord? Are not you my workmanship in the Lord? 2 If to others I am not an apostle, at least I am to you, for you are the seal of my apostleship in the Lord. 3 This is my defense to those who would examine me. 4 Do we not have the right to eat and drink? 5 Do we not have the right to take along a believing wife, as do the other apostles and the brothers of the Lord and Cephas? 6 Or is it only Barnabas and I who have no right to refrain from working for a living? 7 Who serves as a soldier at his own expense? Who plants a vineyard without eating any of its fruit? Or who tends a flock without getting some of the milk? 8 Do I say these things on human authority? Does not the Law say the same? 9 For it is written in the Law of Moses, “You shall not muzzle an ox when it treads out the grain.” Is it for oxen that God is concerned? 10 Does he not certainly speak for our sake? It was written for our sake, because the plowman should plow in hope and the thresher thresh in hope of sharing in the crop. 11 If we have sown spiritual things among you, is it too much if we reap material things from you? 12 If others share this rightful claim on you, do not we even more? Nevertheless, we have not made use of this right, but we endure anything rather than put an obstacle in the way of the gospel of Christ. Here is a graphic arrangement of Paul’s argument in verses 3–12. It may help see the flow of his logic, which I develop in the sermon. How does 1 Corinthians 9 work in Paul’s argument to build up the body of Christ? What does Paul’s personal example do to reinforce his instructions? In 1 Corinthians 9:1–12, Paul uses 16 questions to make his case. What is the effect of these questions? How can / should we use questions in matters of debate and discussion? 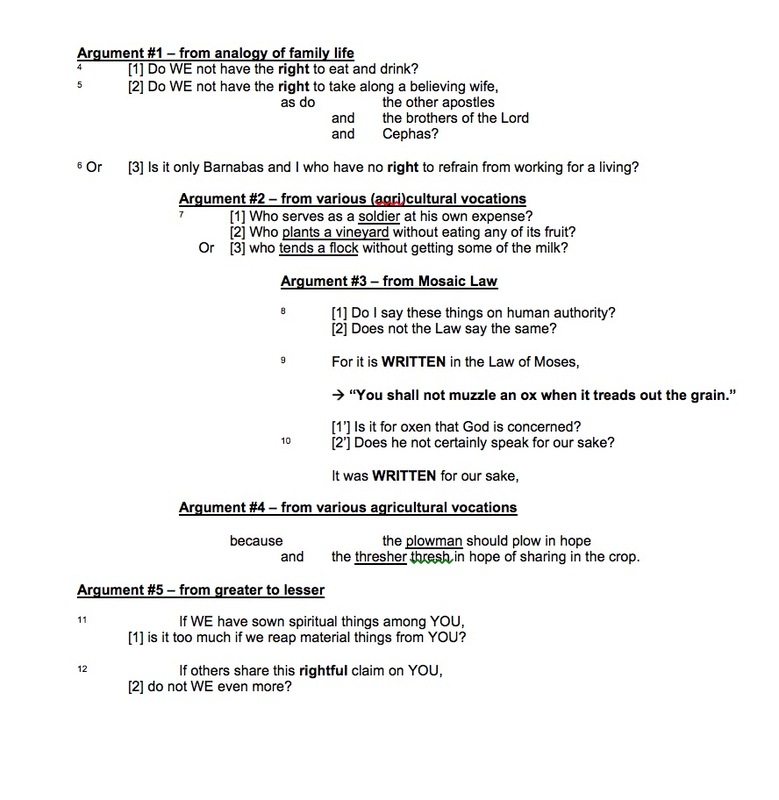 Paul clusters his questions into arguments five arguments (see graphical outline above). How does the shape of his argument help us discern his meaning? Of the five arguments, which is the strongest argument to you? Which argument does Paul put the most weight? Read Deuteronomy 24:17–25:4. How does this passage relate to Paul’s point? In what ways is it similar? In what is it different? How can Paul apply the Old Testament Law to a predominately-Gentile church? (See also 1 Corinthians 10:1–11). After making his case, how does Paul use his ‘rights’? How does this illustrate his point in 1 Corinthians 8? What can we learn about using our rights from his example? How should pastor-elders imitate the Apostle Paul? How should churches support those who devote themselves to the Word (cf. Galatians 6:6–10; 1 Thessalonians 5:12–13, 1 Timothy 5:17–19; Hebrews 13:17)? How does a healthy relationship between pastor(s) and congregation promote the gospel? What Does the New Testament Say about Elders?